The following report is the first part of a larger series compiled by Ömer Çelilk and Ferhat Arslan for ANF. It has been translated into English below. The Kobanê Autonomous Canton, which has won its freedom at heavy cost against a savage ideology left over from the Middle Ages and fueled by weapons of the 21st century, has become the symbol of a new morning still waiting to be born. The cry of freedom which is spreading from this peoples’ revolution has become an object of fear for all tyrants and despots and a melody on the tongues of peoples around the world whose own calls for freedom have been silenced. This resistance and this passion for freedom has become a point of attraction which greets warmly all of those come to its lands. Madrid, Stalingrad and Kobanê. This is the triplet on the lips of all of those who wake up every day with a new dream for life, and who moreover are attempting to realize this dream. What separates these three cities, which rose up to write history for the people against the tyranny of the hegemons, from other places from which revolutions have been born is there emergence as scenes of international resistance. Today Kobanê, which continues the tradition of these two other cities in this new century, has become a sprout of emancipatory, egalitarian, and democratic life in the heart of a Middle east entirely engulfed by the West and its capitalist system. The residents of Kobanê – who like those living in the other cities of Rojava had for years waged a struggle for existence under the oppression of the ruling Baath regime in Syria – are continuing a tradition of the uprisings which broke out against the hegemons in the Middle East. Having come together to form a democratic-autonomous administration together with the other two Rojava Cantons (Cizîre and Efrîn) it has forged its path in opposition to both the Baath regime and to the opposition forces supported by the West and Turkey. It is showing that there is a third way. And for this reason they have become the target of the ISIS gangs – the false messiah of this century. Kobanê has for months faced the attacks of these gangs which attacked Şengal (Sinjar) with the heavy weapons they had seized in Mosul before turning their heads toward the Rojava cantons. It has become a symbol owing to its will to fight against these attacks. As a symbol Kobanê is much more than a piece of land and remains the only place which is close to realizing the dreams of a new kind of life. 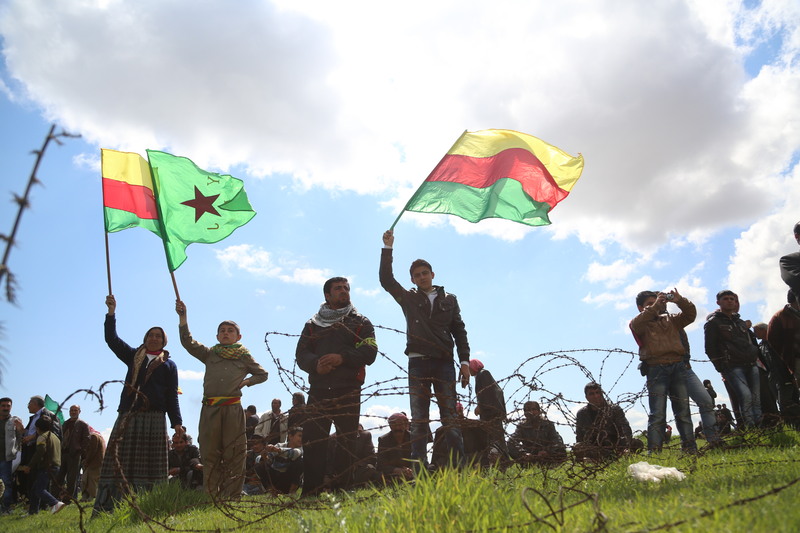 Responding to statements such as ‘Kobane has fallen, it will fall’ from Turkey as the city stood surrounded and under threat of massacre, the October 6-8 protests captivated the whole world, and as result of this resistance and of a support which removed all borders the people of Kobanê declared their freedom to friend and foe alike. We set out on the road in order to witness and understand the revolution being built by these people there. However even today it’s not that easy to get there. Except for local residents returning to their homes and political delegations and NGO’s with prior approval almost no one can get through the Mirşitpinar Border Crossing. For this reason we rely on established contacts and head for the border. After getting in contact with our people along the border we establish a meeting time and sit down to wait. When the established hour arrives we receive news that there is a further 1.5 hour delay and we wait some more. When the appointed hour finally arrived we meet a few people at our rendezvous point. After an initial greeting we begin to shake hands before realizing that one our contacts is missing his right hand above the wrist. At that moment those pictures from the Kobanê resistance come to mind and it is not difficult to to remember the image of that smiling face and that left hand raised in a sign of victory. A few minutes after our chat, on the other side of the border, the guide who will take us to Kobanê arrives in a vehicle. In the car we are seven people in total in addition to these two journalists. Out on the road in the evening darkness a state of suspense grips our bodies and in our minds we are running through our B and C plans in case we encounter any problems. After making sure we were not seen by the thermal cameras in the pitch dark or the armored cars which patrol the area we turn our faces toward the border we begin to move with small steps toward the other side in order to minimize the sound as instructed by our guide. After a small distance our steps fall into unison and our pace quickens. After a short time one our guides turns and and realizes that we are running and unorganized and lets out an angry warning. This time the warning is to walk in a single line to avoid the mines that have been laid along the path. Following this warning we fall into a single line but continue our run. The lay of the field and our backpacks make this difficult. Despite this we reach the border wire within a couple of minutes. On the other side of the wires are the silhouettes of two people. One of them picks up the wire and tells us to cross under quickly. Without a moment’s hesitation we move to pass under. We have difficulty getting our bodies under the way. Some of the barbs have caught on our backpacks. After struggling free of the wires we finally manage to get through and collapse on the ground in exhaustion. Our guide remains on the other side of the wire. At that moment the other person waiting on this side of the border, the one not holding up the wire, crosses to the other side. They greet each other and move away, and our new guide wants us to get moving quickly. We listen to his instructions and follow behind him. We again begin to move forward quietly with slow steps. This ground unlike the other side is covered in knee-high grass. A short while after we enter a canal-like drainage ditch. We go on wading through water which is ankle-deep in certain spots. One of our group walking in the far back must like this as he is yelled at by our guide for walking on top alongside the ditch. According to him the area around the ditch is full of mines and booby traps laid by ISIS. Indeed as soon as he hears the word mines he immediately comes back into the ditch. We continue on in our walk without stopping and after a while we reach the rail-line built by the Germans during the First World War. Its Northern side is known as ‘Serxet’ (Above the line) and its Southern side is known as ‘Binxet’ (Below the line). After we cross the train rails are noses fill with the scent of fresh grass. This smell is one of the reasons that we are slowly able to catch our breath. The nose of a young, strong youth from Kobanê fills with this smell and she pours her desire to step on this grass into words. After these words our march continues silently up a steep incline. At a place where the incline levels out a bit we come across a car waiting for us. As we get into the car the driver starts the engine and we begin to drive forward through a field with the headlights off in order to avoid being noticed. A little while later our car breaks and turns sharply onto a sideroad. As he hits this break our looks, which had been gazing off into the darkness, turn to the driver. As we were wondering what was happening he reaches down to put on some music. A couple of seconds later a number instruments strike up a tune we don’t recognize. A chorus of “hello friends” echoes in the car. We sing along with this welcoming and as the road we follows passes the road sign which informs us we are entering Kobanê and we approach a checkpoint set up by YPG-YPJ forces. We slow down and after the drive waves from the car we pass into the city without stopping. Trenches are visible along the road. It is obvious from first glance that violent clashes took place here on September 16h as ISIS gangs were about to enter the city. We are now in Kobanê. There is no electricity and the city lies in darkness. Yet the site of the rubble is enough to explain the great battle which took place here. Kobanê is waiting for the sun to rise to show us the rest.